Jayapura: Thaha Alhamid, secretary general of Papuan Presidium Council, (PDP),has welcomed the initiative taken by the Papuan Peace Network, the JDP, to seek to solve the Papuan problem by means of a Jakarta-Papua dialogue, and says this should include all the leaders of the struggle for Papuan independence, here in the Land of Papua as well as abroad. He was responding to a report in Saturday’s issue of Bintang Papua’s report regarding the initiative taken by Pastor Neles Tebay regarding dialogue. But he said that the failure to include representatives of TPN/OPM in the JDP was a serious matter, bearing in mind that the OPM is still struggling in the forests of Papua. ‘I realise that there are problems of communication but that doesn’t mean that they should not be represented in the JDP.’ He said he was sure that the JDP would deal with this, bearing in mind the fact that the TPN/OPM was present at the Grand Papuan Congress in 2001. He said that all sides should understand that dialogue or peaceful struggle has been the agreed platform of the Papuan people since the time of the IInd Papuan Congress when it was decided that the Papuan struggle must be pursued by peaceful means and this means prioritising dialogue. ‘What we should focus on is not war but dialogue or peaceful struggle,’ he said. He said that he welcomed the network, the communications, the role of civil society and the good initiative taken by LIPI, the Indonesian Institute of Sciences, to press for dialogue He also recognised that it will not be easy. In the first place, there needs to be an internal Papuan dialogue, which should include all Papuans, including those who are in the forssts, those who are living abroad or wherever they may be, for they are all entitled to have their say regarding the question of dialogue. Secondly, for all those Papuans here in the Land of Papua, there’s no need to consider what their background is because all Papuans have the right to say what they think the dialogue should discuss. In the third place, the JDP has entered into communication with various groups at home as well as abroad in order to start preparing for the dialogue process, and have agreed to a joint approach towards the central government in Jakarta. ‘If we intend to move towards the process of dialogue, bridges will need to be built even if this brings in voices of people who are in favour or against, as all this must be part of the discussion. I am convinced that the JDP is not in any way subordinated to the central government; they are all leaders of civil society who are trying to find a middle way. Dialogue with those everywhere in the world is something that all of us should appreciate,’ he said. The chairman of Commission A of the provincial legislative assembly, the DPRP, Ruben Magai, has called on the police chief to stop using political stigmatisation when conducting operations in Papua. 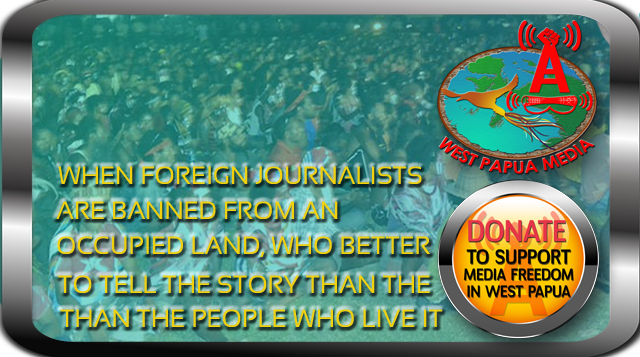 Such statements, he said, result in scaring the indigenous Papuan people and trying to silence them. These remarks followed a recent statement by a police officer [lower down, it is clear that the statement was made by the police chief] alleging that the OPM is present in the region of Degeuwo, on the border between Paniai and Nabire,. where security disturbances have recently occurred. Regardless of whether the police have firm evidence, such statements are a form of character assassination, in a region that is known to have abundant natural resources where investors would be keen to invest, with the backing of the security apparatus. He warned of a high-level conspiracy by people in authority. All this makes the indigenous Papuans harbour feelings of hostility towards those who make such baseless statements. The term NKRI (Unitary State of the Republic of Indonesia) should not be the exclusive property of people in officialdom. People throughout the territory , including those living in the interior, should be able to speak loud and clear about the NKRI. They are living without any guarantees for security in their old age, which is something that should be taken into consideration, he said. The age-long problems will remain unresolved as long as the security forces pursue the approach of violence and intimidation, he said. Similar views have been expressed by the Alliance of Intellectuals of Suku Wolani Moni, who regret the statement made by the chief of police to the effect that the OPM has a base in Degeuwo. He said that he thinks the police chief is playing a new game of distracting attention from all the unresolved problems. ‘Please stop making such allegations about the OPM in Degeuwo. What we want is for the problem of illegal mining to be halted,’ he said. He said that he can’t stop wondering why the police chief is always making such statements which can only lead to widespread feelings of dissatisfaction and result in insecurity for the state. ‘If the OPM is indeed here, they should be arrested. After all, there are plenty of members of the security forces based here,’ he said. Responding to the political dynamics in West Papua where attention has been given to the Special Autonomy Law (OTSUS) for failing to improve the living conditions of the Papuan people, the Indonesian president, Susilo Bambang Yudhoyono has begun to show that he has registered these developments.He has now said that he would soon make an evaluation of OTSUS in both Papua and West Papua. This will happen after the end of the fasting month, Ramadhan (which ends on 10 September). During a one-hour meeting with members of the president’s special staff, they were told that the President had expressed his concern that, despite to large sums of money that have been allocated to Papua every year, the quality of life has not improved. The president believes that there is a need for a ‘Grand Design’ to deal comprehensively with the problems in West Papua. affirmative policy to promote the role of the Papuan people. As the first move, he would seek to improve communications between the central government and the DPRP, the DPRD, and the MRP. The Grand Design would focus on a grand strategy, for the coming twenty years to develop several main sectors such as education, health and the people’s economy. Papuans had reached certain levels of education, how many hospitals had been built with OTSUS funds, how many doctors were working in the hospitals and so on. Papua has been provided with plenty of money, which now amounts to Rp 28 trillion (approx. $2,800,000,000) which is far higher that the money allocated to other provinces. OTSUS money has risen from 1.9 trillion in 2002 to 3.5 trillion in 2008, then to 4.1 trillion in 2009, and even more in 2010. Nevertheless, there have been many demands from the Papuan people to ‘return OTSUS to the central government’. There had been demonstrations in 2008, and now in 2010, people are calling for a referendum. All this has drawn the attention of the president who has now decided to carry out an evaluation of OTSUS, in order to see whether this situation can be improved. law provides for the need to conduct an evaluation every three months. Although an evaluation was undertaken by the DPRP in 2005, no one from the central government bothered to attend, even though they had been invited. Nevertheless, an evaluation was very necessary. Whether the government was still keen to implement OTSUS would be discussed by the main executive bodies of the two provinces and the MRP at a meeting to be held in the third week of October. what we mean,’ he said. ‘But if the president now wants an evaluation of OTSUS, the people must be involved, without third party intervention. It is just between the people and the government, while the role of academics will be very important,’ he said. Vebluum said that he felt it was not too late to conduct the valuation. implementation. An example is about economic achievement, with Papuan women (‘mama-mama) not having a decent place for them to carry out their business. This has still not been attended to. executive, the provincial legislative assemblies , the MPR and the people. The Papuan branch of the National Human Rights Commission (Komnas HAM) has called on the police and the army to immediately end their military operations in Puncak Jaya district because they will never solve the root of the problems in the area. The Komnas HAM statement was made public at its office in Jayapura by deputy chairman Mathius Murib on Wednesday. Murib said that in order to avoid further casualties, the police and the army (Polri/TNI) should immediately stop all operations to hunt people down in Puncak Jaya district and consider other ways of resolving the problems there. He also urged the civilian population in the area to remain calm and consolidate their efforts so as to be able to function normally, and to avoid being provoked by issues coming from irresponsible elements. Murib said that Komnas HAM will be urging the district chief of Puncak Jaya as well as civil society, in particular the church, to draft a comprehensive account of developments during the current year. He said that the role of the church was important because church mediation has been able to solve a number of problems in the Land of Papua, and moreover those involved in the conflict were all members of the church. The Komnas HAM team which has just returned from Puncak Jaya has also called on senior police officers in Puncak Jaya to initiate legal proceedings against all those persons or groups deemed to be involved in the Puncak Jaya case from 2004 up to 2010. ‘The Puncak Jaya case is not a new case and thereforre all individuals or groups involved in the case for the past six years should be brought to account in accordance with the laws in Indonesia,’ said Murib, who has just returned from Puncak Jaya where he conducted investigations.